From north to south, the long coastline of Japan cultivates diverse local lifestyles reflecting unique geographic conditions. People live in harmony with the sea by combining their traditional wisdom with scientific knowledge. These coastal areas, where the sea and human beings are intimately connected, are called “satoumi”. This article and video brief are part of a series exploring several variations of satoumi, or can be watched as one 74-minute film. On the southern coast of Honshu Island, facing Japan’s largest enclosed sea, is a town that is known for its rich marine heritage. Hinase has long been one of the most commercially successful fishing towns in the Seto Inland Sea area. Here about 200 fishing families make their living from coastal fisheries, including oyster farming, small-scale trawling, and coastal pound net fishing (a method for catching fish using a system of nets staked upright). The techniques and lore of these activities, including the design of the local pound nets, were originally developed by Hinase fishermen. All fishing activities in Hinase are coordinated by the local Fisheries Cooperative Association (FCA), which also plays the main role in managing and coordinating satoumi (defined as marine and coastal landscapes that have been formed and maintained by prolonged interaction between humans and ecosystems) activities in the area. The effort to slow the decline of the coastal habitat by re-creating amamo-ba, or eelgrass beds — which are the nurturing habitat of coastal fish — and removing marine waste, has been undertaken voluntarily by the fishing community. During the period of rapid industrialisation between 1950 and the 1980s, 60 percent of the natural coastline of the Seto Inland Sea was lost. 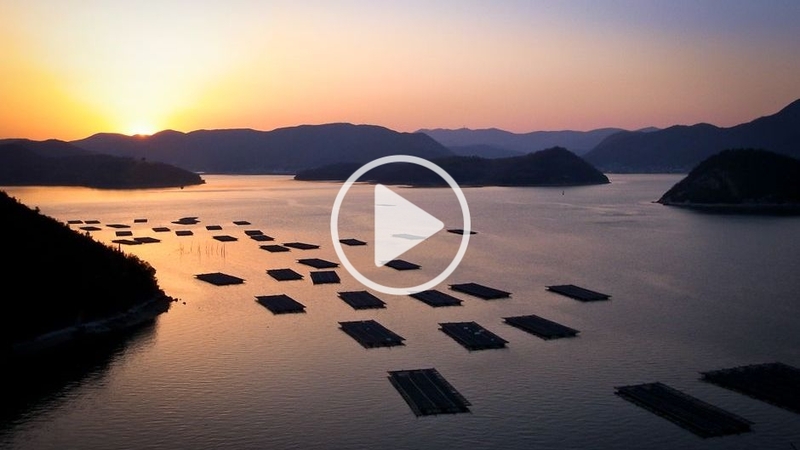 The success of Hinase’s fisheries derives from the highly productive marine ecosystem resulting from the geographical characteristics of the Seto Inland Sea. Generally, the Inland Sea is known for its beautiful scenery, dotted with approximately 3,000 small islands with their tree-covered mountains standing out against the deep blue of the sea. The scenery is much prized by the tourist industry and the national government, which designated the entire marine area as the Seto Inland Sea National Park in 1934. The coastline of the Seto Inland Sea is also known for the development of small-scale fisheries, the output of which represents 25 percent of Japan’s entire fisheries production, including aquaculture. This is due to the abundance of its unique marine habitat, resulting from the convergence of two types of geographical settings: narrow channels called seto; and scattered islets from wider bodies of open sea, known as nada, which divide seto. Due to the setting of the highly enclosed marine geography off Hinase, water circulates to the Pacific Ocean slowly (circulation of the entire waters of the Inland Sea takes more than a year), allowing the accumulated micronutrients released from river basins that pour into its waters to nurture the primary production of the marine ecosystem. Simultaneously, the current of the seto channels prevents a process known as hypoxia in the water, re-suspending the sediment and creating a healthy turbulence in the water. The habitat thus formed accommodates great marine biodiversity, nurturing over 500 species of fish and other rare marine species including porpoise and Japanese horseshoe crab. However, the precious ecosystem of the Seto Inland Sea, so rich in both cultural and biological diversity, was ravaged by coastal development during the period of rapid industrialisation between 1950 and the 1980s. Sixty percent of the natural coastline of the Seto Inland Sea was lost over those 30 years. The geographical and environmental changes that took place severely damaged the coastal ecosystem. Many species of marine life disappeared as swaths of the natural habitat, including mud flats and eelgrass beds, were destroyed, and the quality of the water in the enclosed sea was degraded by river run-off polluted by household sewage and toxic chemicals from industrial plants. The result was extreme cases of anthropogenic eutrophication and chemical contamination of the marine ecosystem. Naturally, the coastal fisheries of the entire Seto Inland Sea were deeply affected, and the ample stocks of fish and the varieties of catch once seen suffered severe damage. After the year 2000, catches declined to half of what they had been in 1985. Hinase prides itself on its long heritage as a fishing community. The more than 200 full-fledged members of the Hinase FCA practice either oyster farming, small-scale trawling or use a type of coastal pound net fishing called Bizen (Tsubo) ami, the methods for which (including the technique and design of the net) were originally developed locally (Bizen is the name of the city of which Hinase is administratively a part, and ami means net). Most of those engaged in fishing in Hinase belong to the local FCA and operate family businesses. The Hinase FCA membership system is unique in Japan in that it is by family rather than by individual. The chairman of the FCA explained that this membership system was initially established as a tool to control fishing in the area, and functioned in the management of the limited space for small pound net fishing. In this way, the local fishing community maintained the units of pound nets in their coastal area and contrived to prevent over-harvest of their marine resources by providing membership only to local families, thereby limiting the entrance to heirs taking over the family business. Consequently, this encouraged those children who did not inherit fishing rights to migrate to other coastal areas and establish new fishing operations. Such migrants were able to succeed by bringing with them the sophisticated techniques and knowledge acquired in the use of Bizen ami pound net fishing. The efficiency and wide applicability of the small pound net is evident in the way the fishing method has become popular for the fishery migrants from Hinase both in Japan and overseas, including in Korea and China. Nonetheless, the main type of fisheries in Hinase shifted to oyster farming due to market demand and the decrease in catch and changes in fish prices that made traditional pound net fishing less economical and less commercially viable. Despite these changes in fisheries, the Hinase FCA membership system retains its initial form and the members support community traditions and solidarity, which the chairman believes is the key to sustaining their fishing heritage. In the 1960s, a governmental project to enhance local fish stocks was implemented in the Seto Inland Sea. The project, known for its slogan “From catching fish to cultivating fish”, involved releasing cultured juvenile fish stock into the coastal enclosed sea in order to enhance stocks of commercially valuable fish. This was in response to the damage dealt to fish stocks by the environmental changes that took place in the region due to postwar urban and industrial development. Although there was relatively limited coastal development in the Hinase inlet, the combination of water pollution and landfill altered the coastal environment by destroying the natural coastal habitats, including eelgrass beds and mud flats. It was at that time that local fishers, particularly those who used small-scale pound nets to catch shrimp, blue crab and coastal fish such as sea bream, observed the depletion of fish stock. Juveniles of those species were propagated and released, but the catches did not increase and the stocks did not recover. The culture and release of sole and blue crab juveniles had the same disappointing result. After several attempts to increase fish stocks by releasing juveniles and observing the results, the fishing community in Hinase recognized that it would not be possible to recover fish stocks simply by artificially increasing the number of juveniles. The operators of pound nets who work closely with the coastal marine waters declared the scheme a failure, particularly due to the absence of amamo-ba that had radically decreased in Hinase and generally in the Seto Inland Sea due to water pollution and coastal development. The area of eelgrass beds in Hinase declined significantly from 590 hectares (ha) in the 1940s to just 82 ha in 1971. The daily routine of pound net fishing starts with fishers sailing out to small Bizen ami nets set in shallow waters between three and five metres, only a few hundred metres offshore. They bring the nets back to the shore in the early morning and sort their catch. After collecting the nets, the fishers spend their days mending the nets on the beach. During the time when they sail their small boats to collect the nets and also repair nets on the beach, they closely observe the coastal waters, noticing even minor changes in the marine environment. From this close observation, the pound net fishers are familiar with the way the eelgrass beds function as the nurturing habitat of coastal fish where juveniles protect themselves from predators. Thus, as explained by some experienced fishers, releasing cultured juveniles into coastal waters with almost no eelgrass beds is the same as releasing them straight into predators’ mouths. Once this local wisdom was recognised, in 1985, the members of the Hinase FCA initiated the project to restore the eelgrass beds. The local research institute for fisheries (the Okayama Prefectural Fisheries Experiment Station) provided instruction on techniques for cultivating and planting eelgrass, and members of the fishing community undertook planting in the areas where they remembered the original amamo-ba had been found. The eelgrass survives by photosynthesis, so the water where it flourishes needs to be clear and less than three metres in depth. The fishers know the exact location of such areas because they had customarily avoided the eelgrass beds in order to prevent their boats’ propellers from becoming entangled in the eelgrass. Later, this local wisdom was supplemented by scientific research conducted by local fisheries officials. Together with scientists, the officials studied the ecological factors determining the quantitative growth of the eelgrass, such as water salinity, seabed conditions and wave movements. Through the research, they found that in some of the areas where the eelgrass beds had been, recent environmental changes had affected the water salinity and seabed conditions, making the artificially planted eelgrass less resilient. Having understood that the habitat could not be recovered only by replanting eelgrass, the local fishery officials then sought to artificially adjust the seabed conditions and salinity by raising the seabed floor and mitigating the wave movements through the use of floating wave dissipating devices. As a consequence of this local governmental support, together with continuous community efforts in planting eelgrass, the amamo-ba in Hinase increased from just 12 ha in 1985 to almost 100 ha in 2009. The recovery of Hinase’s amamo-ba is still in progress, as only 20 percent of the initial beds reported in 1940 have been recovered, despite almost 25 years of community and local governmental effort. So far, the application of both local and scientific knowledge has been advantageous in practically re-creating the habitat and in orchestrating cooperation by the governmental sector, scientific experts and the fishing community. This article is an abbreviated version of the paper: Yoshitaka O. and M. Torii. 2011. “Mobilizing local wisdom and scientific knowledge: re-creating eelgrass beds in Okayama” in Biological and Cultural Diversity in Coastal Communities: Exploring the Potential of Satoumi for Implementing the Ecosystem Approach in the Japanese Archipelago. Secretariat of the Convention on Biological Diversity Technical Series No. 61. 70-75. Re-creating Eelgrass Beds in the Seto Inland Sea by Yoshitoka Ota and Masaya Torii is licensed under a Creative Commons Attribution-NonCommercial-ShareAlike 3.0 Unported License. Mayama Torii is the Assistant Manager of the Fisheries Division, Department of Agriculture, Forestry, and Fisheries, Okayama Prefecture. He specializes in fish breeding and improvement of coastal environments, including restoration of eelgrass beds and tidal areas. Yoshitoka Ota is the Co-Director of the Nereus Program and a Nippon Foundation Senior Research Fellow at The University of British Columbia. As a social anthropologist, he specializes in fishing practices, including the economics, social organization and lifestyles attached to this activity. Dr. Ota has interdisciplinary fisheries management and field-based research experience in Micronesia (Palau), Indonesia (post-tsunami Aceh), the UK and France (English Channel) and Australia (Victoria). Prior to joining The University of British Columbia, Dr. Ota was based at the Ocean Policy Research Foundation in Tokyo where he worked on issues concerning community-based management, coastal habitat reconstruction (satoumi) and marine spatial planning.